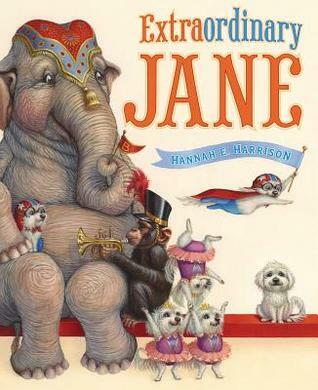 Jane is an ordinary dog that lives among extraordinary animals at the circus. Try as she might, she can't seem to find what her talent is. But for the people in her life, being Jane is just enough for them. As I turned each page, the knowledge crept up on me that I was reading something really special. The illustrations are some of the most endearing I have ever laid eyes on and they tell more of the story than the words do. By the time I got to the last page I was weeping. I have such a soft spot for dogs, what can I say, and Hannah Harrison just knows how to illustrate love into her paintings. I wish she were on Twitter so I could tell her how much this book touched me. Up until this point, the only other picture book illustrator whose art has made me cry is Kadir Nelson. This might very well be my favorite picture book of 2014. I'm putting this one on my "Caldecott contender" shelf on Goodreads. It is also going on my "heartprint books" shelf as it has found a permanent place in my heart for sure. When I first saw the cover of this book, I thought Extraordinary Jane was going to be the elephant since she's such an imposing figure in the illustration. But now that I've read the book, you can clearly see that the animals on the cover are pointing their attention toward the diminutive white dog on the right -- all except for the chimp. It's details like that, among many others, that make me think this is a book that might get some love when the Caldecott is announced in January.